Katherine Heigl in "State of Affairs"
September 2014 — Katherine Heigl ("Grey's Anatomy") poses for a photo at Rene Veluzat's Blue Cloud Movie Ranch in Bouquet Canyon where the star was appearing in flashback scenes for an episode of the new political thriller, "State of Affairs" (debuting Nov. 17, 2014, on NBC). 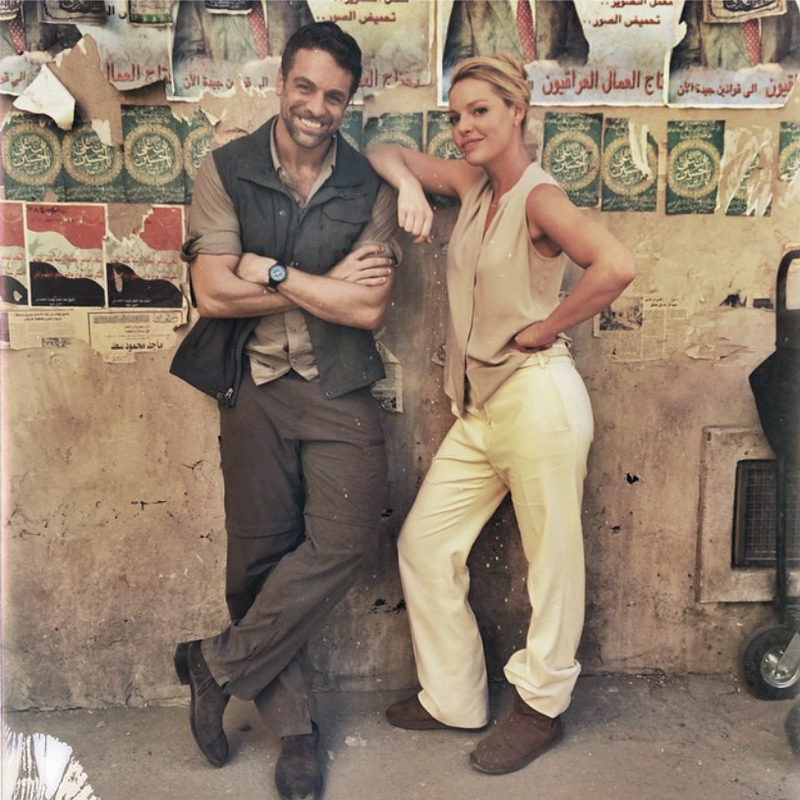 Heigl's caption to this photograph, which she posted on Instagram, reads: "Santa Clarita played the part of Kabul Afghanistan today for @nbcstateofaffairs. Kinda blew my mind..."
The photograph was quickly lampooned because the posters on the wall behind the actors are in Arabic and they're from Iraq, not Afghanistan. The posters in the bottom row use, as a background, the old Iraqi flag from the Saddam Hussein period. Other posters mention "Iraqi workers," while the green posters in the middle row read, "Hussein, the son of Ali" — a Shi'ite reference. Most Afghans are Sunni Muslim, and most speak Pashto or Dari (Afghan Persian/Farsi), not Arabic. A small minority speaks the Turkic languages, Uzbek and Turkmen. But enough fun with this. According to NBC, "Katherine Heigl stars as top CIA analyst and presidential advisor Charleston Tucker — a keeper of our nation's secrets ... with a big secret of her own." NBC Mondays at 10PM, 9PM Central. LW2704: 19200 dpi jpeg from Instagram photo posted by Katherine Heigl.